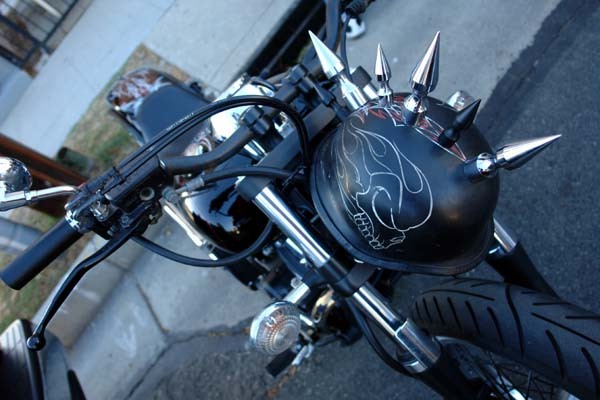 I know the graphics are very minimalistic, but you gotta admit, that attitude has got to be a part of the kustom kulture too, and this one has it in spades! Huntington Beach Bodyworks had their entire display set up at CKK. 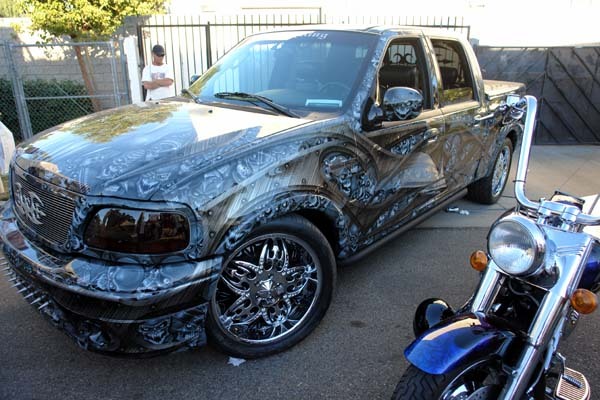 This truck definitely gets the award for most skulls per vehicle. Kiwi Willey definitely put some hours into this badboy!! 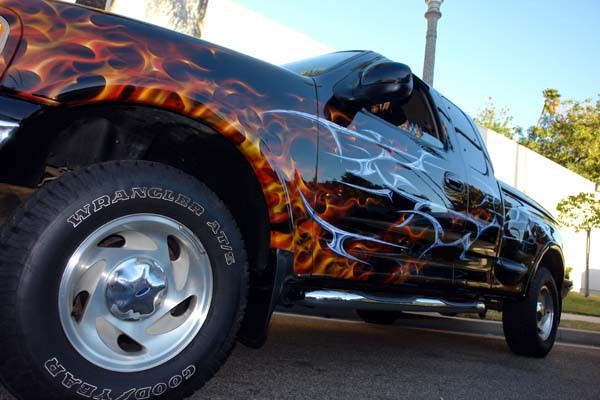 Even a stock truck needs a kewl paint job. Besides being owned by a girl, the paintjob was also done by her? Very kewl. 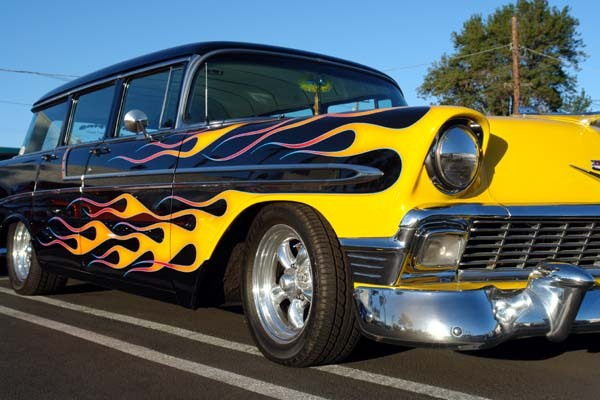 You gotta dig the traditional hot rods,..and there was plenty of them at the CKK party to dig! 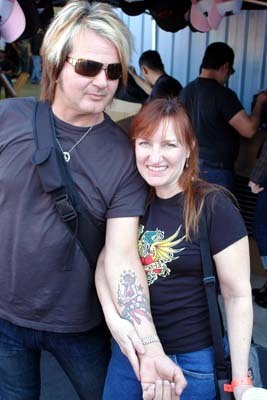 Deb grabs Rikki Rocket to show off the Tattoo she designed for him. The tatt was actually party of the 20th anniversary drum set we painted for Rikki, and Poison for last years tour. Rikki just liked the design so much, he wanted to make it a little more permanent! 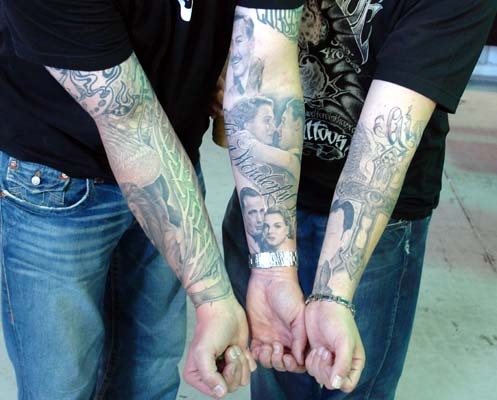 Not to be outdone in the Tattoo category, Noah, and Franco show off their collective tatts. If you have not seen any of Francos work in person?? Just glue a photograph to your arm,..and you will be close. Cept, Francos work is better! !.